This is the second part of The Thin Red Line, an African Arguments series focusing on dynamics around the Red Sea. For over 25 years, maritime strategy and port development in the Red Sea and the Gulf of Aden appeared relatively static. Eritrea looked inwards, neglecting its coast. Djibouti flourished, lucratively embracing Ethiopia’s trade, overseas investors and foreign military bases. Somalia’s shores became synonymous with piracy, prompting Western and Asian naval maneuvers, quietly ensuring free passage to the Suez Canal. But now things may be changing. Ports in the Horn of Africa and Gulf of Aden are suddenly in the spotlight. These developments beg three key questions. Firstly, why are countries in the Horn of Africa developing so many new ports? Secondly, who will finance these projects? And finally, how do control of ports in the Horn relate to the war in Yemen? Why so many new ports? The first question is the most straightforward. The Horn needs improved ports and infrastructure to handle the current pace of Ethiopia’s economic growth, on which broader regional integration and prosperity relies. This is why ports have been one of Prime Minister Abiy’s priorities on his foreign visits. In Djibouti, he called for joint investment in the tiny nation’s ports. In Sudan, he and President Omar al-Bashir presented plans to modernize Port Sudan together. And in Somalia, he announced that Ethiopia would work with Mogadishu to upgrade four Somali ports. Land-locked Ethiopia is clearly looking to break its heavy dependence on Djibouti, which has handled 90% of its foreign trade since the border war with Eritrea was triggered in 1998. However, it is crucial to understand that Addis is only seeking to diversify its access to the sea – and drive-down freight costs via increased competition – rather than reduce its use of Djibouti. In fact, these trade volumes will continue to grow as Ethiopian, Chinese and Djiboutian authorities have invested heavily in upgrading and enhancing infrastructure capacity along the Djibouti corridor. Earlier this year, the centerpiece of this strategy – the 750km railway linking Addis Ababa to Djibouti – began full operations. The $3.4 billion project – financed, constructed and managed by China – has drastically cut the time and cost of shuttling containers between Ethiopia’s capital, it’s nascent manufacturing export zones, and Djibouti’s ports. 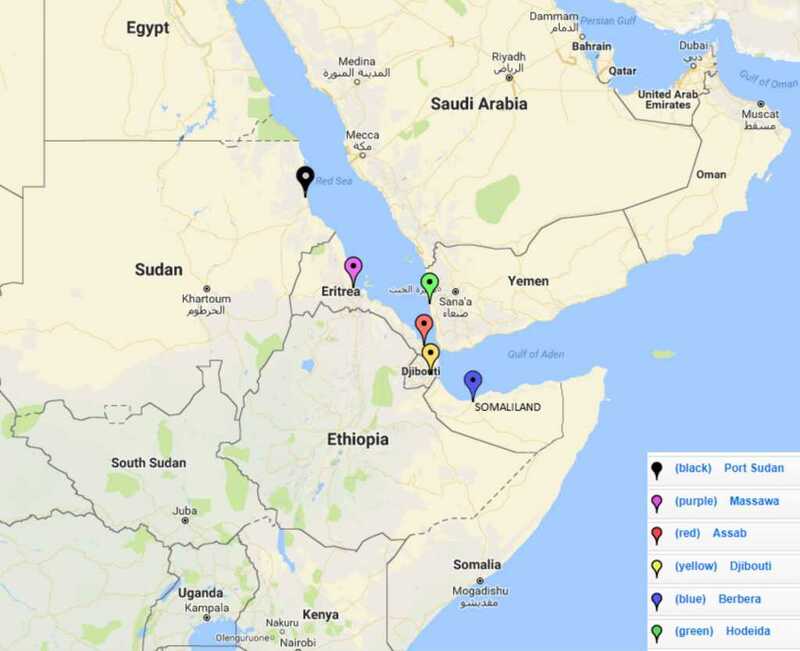 The development of prospective oil and gas projects in Ethiopian Ogaden and neighboring Somali states, which would also be exported via Djibouti, reaffirms the port nation’s ongoing centrality to regional growth and integration. This relationship is as crucial to Djibouti as it is to Ethiopia. Port transit fees are the mainstay of Djibouti’s exchequer and it has invested substantially in further developing this infrastructure. It constructed vast new container and cargo facilities in the form of the $590 million Multi-Purpose Port (MPP) at Doraleh. Meanwhile, it has begun developing smaller ports too. Tadjourah is designed to handle Ethiopia’s potash; Damerjog will have facilities to export livestock and liquid natural gas (LNG). Djibouti’s ambitious “Vision 2035” blueprint for national development sees its harbors as a hub for Asian transshipments, servicing the entire region. As it develops ports and extensive Free Trade Zones with its Chinese partners, the entrepôt nation will remain critical for Ethiopia and prospects of regional economic integration, irrespective of developments in Eritrea or Somalia. It also seeks to maintain its competitively vis-à-vis Kenya’s LAPSSET corridor, which aims to link its coast at Lamu to South Sudan and Ethiopia. The second question this raises is who is paying for all this. For Ethiopia and Djibouti, the key actor is China. Djibouti’s major infrastructure initiatives are being financed and spearheaded by Chinese companies. Djibouti’s new multi-million MPP facility at Doraleh, for example, is managed and part-owned by China Merchants Group (CMG). Since 2013, the Hong Kong-based conglomerate has owned 23.5% of Djibouti’s Port and Free Zone Authority (DPFZA) and, in early 2017, bought a minority stake in Ethiopia’s state-owned shipping line, whose home port is Djibouti. CMG is a leading commercial actor in numerous ports along China’s Maritime Silk Road, which links shipping lanes along Beijing’s global Belt and Road Initiative. As Thierry Pairault has highlighted, CMG’s role in Djibouti mirrors Chinese involvement in ports and logistics elsewhere in Africa. 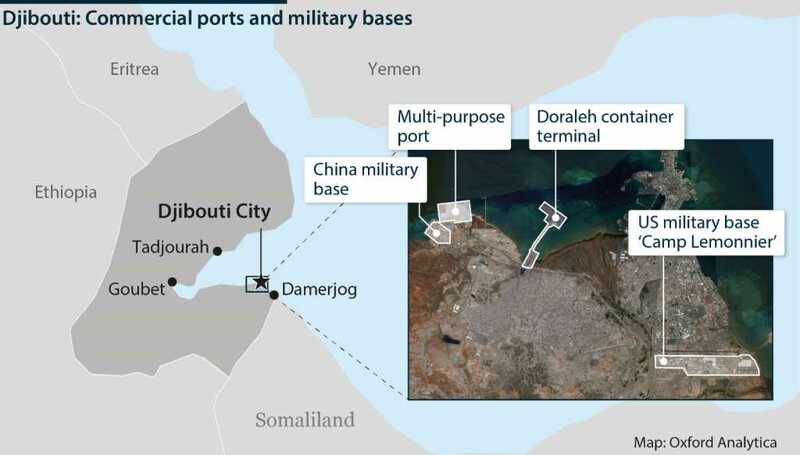 However, Djibouti is unique in two ways: firstly, it is a telecommunications hub where several key transcontinental submarine fibre-optic cables meet; and secondly, it has been home to China’s first permanent overseas naval base since 2017, when it opened next to the MPP, barely 12km from the US AFRICOM base at Camp Lemonnier. Chinese companies also have significant stakes in Ethiopia’s oil and gas fields in the Ogaden region. In November 2017, they agreed to construct a 650km oil pipeline to Djibouti and proposed building an LNG refinery at Damerjog. The other key actor is the UAE. Until the opening of the China-run MPP in Djibouti last year, all of Ethiopia’s container traffic was channeled through the adjacent Doraleh Container Terminal (DCT). This facility had been managed and part-owned by the Dubai-based company DP World since 2008, but this February, Djibouti unilaterally terminated its contract and nationalized its 33% shareholding. This was the culmination of a fractious six-year legal battle. DP World is seeking compensation for its lost assets, and until the case is resolved in a London court, the Djiboutian government will have difficulty selling the sequestered shares legally. However, given Abiy’s surprise proposal that Ethiopia and Djibouti hold stakes in each other’s ports and telecommunications, it is possible that Ethiopia may obtain a minority shareholding in Doraleh Container Terminal. This could plausibly be part of a deal involving Chinese loans that could also see CMG gain a bigger slice of DPFZA equity. While this spat has seen UAE’s long-standing involvement in Djibouti diminish, DP World is simultaneously increasing its footprint in neighboring ports. In May 2016, the company signed a 30-year deal worth $440 million to develop Berbera port in the self-declared state of Somaliland. In March 2018, DP World scaled back its proposed investment but announced that Ethiopia would take a 19% stake in the project, alongside its own 51% share and the Somaliland government’s 30%. The company is also investing in building a highway to link the port to Ethiopia’s border. Meanwhile, the deal has allowed the UAE, which is playing an increasingly central role in the war in Yemen, to develop a naval base alongside Berbera. The DP World deal is the first large international contract signed by the autonomous government of Somaliland. This has angered the Federal Government of Somalia, which doesn’t recognize the Somaliland government’s sovereignty over Berbera. This has, in turn, fueled a spat between Somalia and the UAE, leading the latter to withdraw military supplies and advisors and close the hospital it was funding in Mogadishu. The row also compounded allegations that the Somali government is being manipulated by Qatar and its ally Turkey. Qatar reportedly helped finance President Mohamed “Farmaajo’s” election campaign, while Turkey is the Somali government’s leading economic partner. What are the UAE’s plans for Yemen and the Horn? The fact that the UAE’s involvement in Berbera has enabled it to set up a naval base there leads us to our third question: how is competition over new container and cargo ports linked to the war in Yemen? This is the most difficult to answer, but it is clear that as the UAE’s prosecution of the war against the Houthis has intensified, so has their engagement in the Horn of Africa. Since 2015, the UAE has massed military and naval hardware alongside covert training and detention facilities in the Eritrean port of Assab. Its armed forces are also now present in Berbera in Somaliland (as well as on Socotra Island and Yemen’s southern coast). Is the war in Yemen also the reason that UAE authorities now appear to be investing energetically in diplomatic overtures to both Ethiopia and Eritrea? In May, Prime Minister Abiy visited the UAE. In June, Crown Prince Sheikh Mohammed bin Zayed Al Nahyan of Abu Dhabi (MBZ) returned the favor. During this visit, the UAE’s de facto ruler announced a $1 billion emergency loan to ease Ethiopia’s acute forex shortage and promised further foreign direct investment. It was then an Emirates plane that ferried the Eritrean delegation to Addis on 26 June. Furthermore, Eritrea’s President Isaias Afewerki was subsequently welcomed to Abu Dhabi prior to Abiy’s arrival and effusive proclamation of peace in Asmara on 8 July. There are also recent hints from Saudi Arabia and UAE suggesting they may back Ethio-Eritrean rapprochement with substantial funds. Some analysts claim these would be used firstly to rehabilitate Eritrea’s ports of Assab and Massawa. They would then help finance infrastructure linking Assab to Addis Ababa and, far more ambitiously, Massawa to Mekelle, the capital of Ethiopia’s Tigray region. This may be wishful thinking and/or hubris. Nevertheless, Ethiopia has ambitious, fully-costed long-term infrastructure plans, involving rail, road, air, and sea routes. Encouraging rival Arab and Chinese investors to compete for a share of the profits generated by integrating Eritrea’s ports back into Addis’s long-term infrastructure plans should be relatively straightforward. However, it is far less certain whether Eritrea’s dilapidated authorities can undertake domestic economic reforms and facilitate competitive tendering for a new port and maritime services while fulfilling short-term pledges to the UAE. It is unclear how realistic the suggestion of Arab finance behind the peace-deal is. It is also impossible to tell whether the UAE’s recent diplomatic activism reflects a medium-term political strategy or whether it is simply an opportunistic response to changes in the Horn and a tactical stop-gap in the bloody stalemate in Yemen. Does the UAE have a concerted plan in the Horn of Africa? Does it foresee that its military lease of Assab could be transferred to DP World once Yemen’s Houthis have been bombarded or starved into submission? It is too early to tell, but what is clear is that the ports in the Horn of Africa are proving to be of increasing interest to rival Arab and Chinese investors and that the politics of ports have become central in shaping political alliances and enmities across the region. David Styan teaches in the Department of Politics, Birkbeck College, University of London. This is an edited version of recent work on the topic. Michael Rubin: Should Puntland Dispute Freeze Somaliland Autonomy?